Quickly it's going to be done! (Well, maybe not so quickly) I do plan to pick up stitches on the diagonal edge and add some welting.. How much? I am not sure! As much as I have yarn for! At least one set of welts (3 rows of stockingknit and 3 rows off reverse) I'd like more welting.. but I don't plan to buy any more of this yarn—I started with 3 damaged (2 label-less, and one a bit shopworn (knotted and messed up) skeins from a clearance bin... Any more yarn would be full price. But I do think it will better with at least some welting. 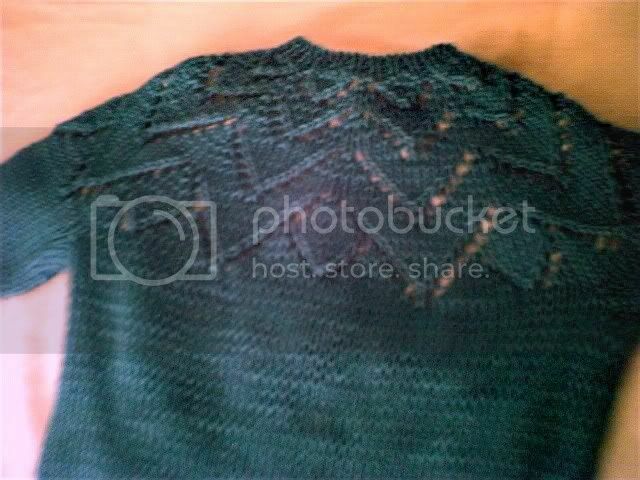 I'll work on it today, and maybe take a photo when I finish off the main triangle--the welted edging will fit on a single circular needle, but it will be wrinkled and bunched up as I knit--and it won't photograph well. But--definitely a photo when it's done! See here: 4 little devil's horns knit for the egg head hats. Today they will be grafted onto the hats, and I'll have Deviled Eggs! My plan was to graft them to the hats last night—but that didn't happen. No one in my family was a big fan of hard boiled eggs—so most of my children's holiday eggs were blown eggs. The girls dad loves deviled eggs—but there is no way to hard boil eggs (and decorate them) if you are making deviled eggs! I just have been starting, and starting but not finishing...The baby sweaters are still missing sleeves. The egg head hats still are missing their devils horns. And suddenly, all those project bags with socks kits in them are looking so attractive! I am jonesing to knit a pair of socks.. and I got it bad. A broken right arm (on a righty) plays serious havoc with knitting. And a frozen shoulder on another group member doesn't help her knitting —any more than ambulatory issues on a third is any help in having her join us--especially when this winter has been one of snow and ice! I had my own set back with the lose of my knitting mojo, which is slowly coming back--but the other issues are getting resolved.. Collectively we are all better, and getting together monthly, if not weekly. So here is MOST of a shawl--(only 6 (maybe 7) pattern repeats left to go.. (but each pattern repeat is 24 rows!) --it's Red Hearts Unforgettable (a single ply acrylic from the Boutique collections). The good news is there is are 12 decreases in every pattern repeat, so the row get shorter (and easier to work)--the bad news is there are still a lot of rows to go! The pattern is a series of welt, (3 rows of stockingknit, 3 rows of reverse stockingknit) and every 4th welt has a little bit of lace. The diagonal edge will have a welt or two added to finish the shawl. I think. I like long baby sweaters—ones that cover them from shoulder to hip—I am tempted even to knit a sack—a long long sweater from shoulder to toe. So its time to start a hem, and then go one to work the sleeves. The matching hats will be mostly pink, (a closely matching solid pink acrylic) –to make it clear these are baby girls—since these sweaters are really unisex with all the blue. Thought the bit of lace at the shoulders does make them a little girlish. These egg hats have been done for almost 2 weeks now—well done-- but not deviled. I know I have some (a partial skein) of red yarn—but where it is? It is a mystery. I've done 2 projects, and started a third while I continued to look for the red yarn. I'll finish the sweaters first. I just go a few row of the plain stocking knit below the arms done yesterday, so there isn't much of change to see—You'll have to wait till Monday. By then, I should have some real progress to show off. In the clear light of day, I frogged, and then cast on again—perfectly--the first time. I worked some ribbing, made some increases, and began an other version of a favorite pattern—well an adapted version of a favorite pattern. The pattern isn't as obvious as it could be in this busy yarn—but I am happy with the results—none the less. Both sweaters are being knit at once--(just one in pictured)--and I am still on ball 1 (of 5 available) and should have plenty to finish both sweaters, and to make a hat, too. 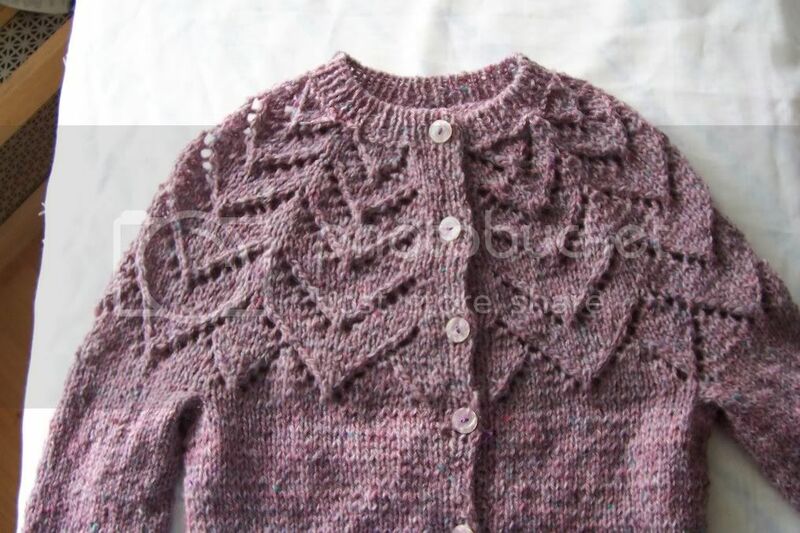 I love this pattern—the sweater yoke is about 90 rows--(half of which are plain purl) the other rows? Each one is different! I have used this pattern in sweaters, and in hats, and shawls, and now, back to sweaters. But for this version, there are fewer repeats of the petal like lace pattern--(3 teirs instead of 4 or 5)--so the 90 row yoke will be closer to 60 or maybe a 76 row yoke. There are fewer petals, (pattern repeats in each row) too, so instead of the optimal increases (8 every other round) there are only 7--but babies have narrow shoulders and this shouldn't be a problem.--Plus--Lace is stretchier than stocking knit, so the lace will provide the ease needed. So these sweaters will have a yoke with fewer repeats--and shorter--than I've done in the past--but i think they will be just as pretty. Once I worked out the pattern, it's been easy to adapt, and do again and again. The first row is the hardest—getting things set up—after that, it is—to me—almost mindless knitting.